Another sad news befell on one of our KAFV member. Lt PengChun Uy (EON 9) passed away yesterday 4/10/2019 at LAC USC Medical Center. The KAFV expresses our deepest condolences and heartfelt sympathies to family and relatives of the deceased. We pray for his soul Rest In Peace. Our KAFV, Col. Sar Butha, Class EON 2, passed away this morning in Virginia, USA. I will inform you later when further information is available. Our thoughts and prayers are with friends and family of Col. Sar Butha. With our sincere and deepest condolences. We just received a sad news that our Cambodian Veterans just lost another fighter, KAFV Capt. Tith, Sarun (EON 8A), passed away on April 15, 2018. He was a brave helicopter pilot during the war of 1970-75. Our prayers are with family and friends of Capt. Tith, Sarun. 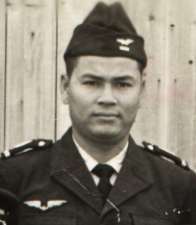 I just received a sad news that one of our compatriots, former Khmer Air Force Pilot, Lieutenant Tan Ty (EON 8B) passed away on Tuesday, January 23, 2018 in P.Penh, Cambodia. Cambodian Veterans expressed our deepest and sincere condolences to friends and family of the deceased. PS: For more info, please contact his classmate Mr. Vannac Om. It’s with a heart broken to learn that my former brother in arms in the helicopter squadron, KAFV Capt. OU, KIM NOEUN, Class EON 8A passed away last Saturday, September 30, 2017 in Anaheim, California. He came from Seattle, WA with his family to attend the wedding of his relative. 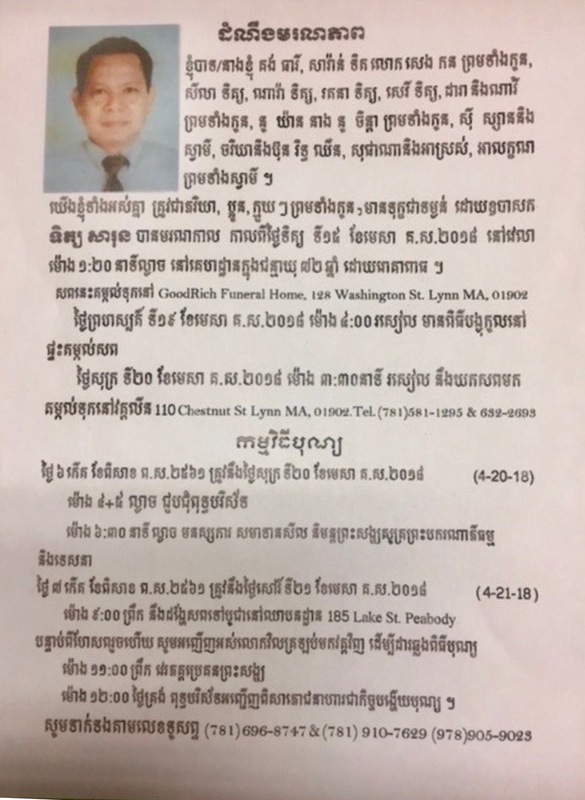 Cambodian Veterans shares this great lost and sorrow with friends and family of the deceased. (Cambodian Buddhist Society ), Mill Creek, Washington. 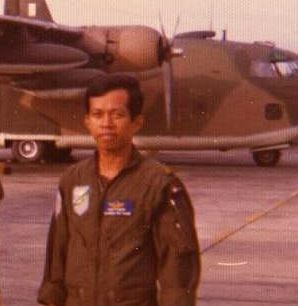 We just lost one of our elite brother, former Khmer Air Force pilot Major Chum, Yuthan (EON 6, flyer of C-47, AC-47, C-123 and AC-123 aircrafts) last Saturday August 12, 2017 at his hometown Honolulu, Hawaii. one of the numerous aircraft he flew. Chum Yuthan was born on June 29th, 1939 at Phnom Penh, Cambodia.